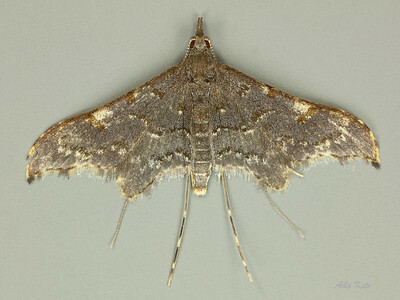 Aluctoidea is the disputed superfamily of many-plumed and false plume “micromoths”. Their wings characteristically consist of many separate, narrow, membrane strips around the major veins rather than the continuous sheet in all other moths. At rest the “plumes” partly overlap giving the appearance of solid wings. According to a recent review by Charles Mitter and colleagues (2017) they comprise at most 235 described species in two families - Alucitidae (many-plumed moths) and Tineodidae (false plume moths, with the latter sometimes merged with Alucitidae. 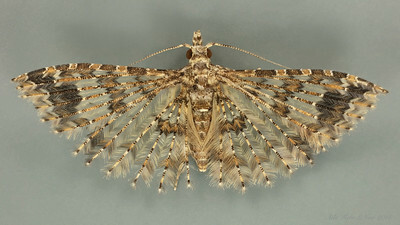 Most of the species belong to the Alucitidae. The closest living relatives are the plume moths (Pterophoroidea) with 318 described species in a single family.